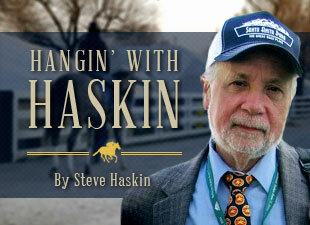 This column is about Titans of the Turf, both equine and human. It is about Dr. Fager and Damascus and John Nerud and Frank Whiteley, a portion of which I ran several years ago, with a great deal more added. I have never seen a trainer take more satisfaction in winning a race than John Nerud did after Dr. Fager defeated his arch rival Damascus in the 1968 Suburban Handicap, in what was one of the great confrontations of all time; not so much the last part of the race, but the incredible battle early on between two horses who were not at their best going into the race, but still had to carry staggering weights going 1 1/4 miles. Considering Dr. Fager was coming off a severe colic attack that not only kept him out of the Met Mile, a race he most assuredly would have won, but nearly cost him his life, this very well could have been Nerud’s greatest training job. This was a time when handicaps were truly handicaps and not the feeble imitation into which they have mutated. A time when trainers accepted weights and weren’t afraid to put their horses in a position to get beat. A time when great horses not only carried heavy burdens, but broke track records in spite of them. A time when trainers were as tough and tenacious as their horses, having come up during The Depression. A time when the majority of horses were homebreds owned by classy sportsmen and were born, raised, broken, and trained at home and not subjected to the sales ring. In 1968, racing fans had been clamoring for a rematch between racing’s two titans, Damascus and Dr. Fager, since the previous September when Damascus annihilated Dr. Fager, as well as reigning Horse of the Year Buckpasser, in the Woodward Stakes to clinch 3-year-old and Horse of the Year honors. The two future Hall of Famers had first faced each other in the one-mile Gotham Stakes, with Dr. Fager edging out Damascus after a furious stretch battle, but managed to avoid each other until their showdown in the Woodward. Dr. Fager’s trainer, John Nerud had decided early on to bypass the Triple Crown and major mile and a quarter races, biding his time and picking his spots until the tempestuous Dr. Fager had a chance to mature and harness some of that blazing speed. In the Woodward, both Frank Whiteley, trainer of Damascus, and Eddie Neloy, trainer of Buckpasser, both employed “rabbits” to soften up Dr. Fager, who had been known to get his blood up when a horse looked him in the eye. In the rich New Hampshire Sweepstakes at Rockingham Park, In Reality tried to surprise Dr. Fager, sneaking through on his inside down the backstretch and attempting to catch him off guard. The Doc responded by reaching over and trying to savage his opponent. Whiteley, known as The Fox of Laurel, was as shrewd as they came; perhaps one of the few trainers who could rival Nerud in that department. Neither ever left a stone unturned and it was nearly impossible to get an edge on them. Both came up the hard way and had to scrape and claw for everything they got. You might beat them, but you could never out-train them. In the Woodward, Ron Turcotte, on Damascus’ rabbit Hedevar, a former world-record holder at a mile, and Bobby Ussery, on the quick-footed Great Power, charged out of the gate screaming and whipping their horses with the sole intention of getting Dr. Fager stirred up. With Dr. Fager in between the two of them, it was the perfect scenario to ambush the Good Doctor. Even though substitute jockey Bill Boland had a stranglehold on Dr. Fager, there was no controlling the colt’s speed, and he proceeded to cut out suicidal fractions of :45 1/5 and 1:09 1/5. It was an amazing sight to see Turcotte and Ussery whipping and driving their horses out of the gate and still unable to outrun Dr. Fager, who was under stout restraint by Boland. But Boland was no match for the speed and raw power of Dr. Fager, and there wasn’t a jockey alive who could hold the Doctor when his blood was up. Damascus, who had won the Preakness and Belmont Stakes, was in the form of his life, having defeated top quality older horses in the Aqueduct Stakes, giving Widener Handicap winner Ring Twice six actual pounds. Before that, he had come from 16 lengths back in the slop to win the Travers Stakes by 22 lengths eased up and still equaled the track record in the slop. And this was after breaking the track record at Arlington Park, defeating In Reality by seven lengths in the 1 1/8-mile American Derby in a sizzling 1:46 4/5. In the Woodward, Damascus’ devastation of his opponents continued, as he left Buckpasser for dead and blew right on by Dr. Fager at the quarter pole to win by 10 lengths. Nerud knew Dr. Fager, who was wrapped up on by Boland after Damascus passed him, was not at his best that day and wanted another crack at Damascus without the aid of rabbits. A frustrated Nerud approached New York Racing Association chairman James Cox Brady after the race and said, “You tell them I’ll put up $50,000 and the Association will put up $50,000. Winner-take-all, Dr. Fager against Damascus. They (Damascus’ connections) put up nothing.” But Brady quickly nixed the idea. Dr. Fager, instead, went to Chicago and easily won the 1 1/4-mile Hawthorne Gold Cup, while Damascus toyed with his opponents in the two-mile Jockey Club Gold Cup before dropping a tough nose decision to grass star Fort Marcy in the Washington D.C. International in his first ever attempt on the grass. It was his 16th start of the year, in which he won 12 times, 11 of them stakes. Throughout the winter and spring, all the talk was about a Damascus—Dr. Fager rematch. Nerud felt Dr. Fager finally was mature enough to handle Damascus going a mile and a quarter. The year started out well enough with victories in the seven-furlong Roseben Handicap and 1 1/16-mile Californian Stakes, both under 130 pounds. Nerud had actually been told by Hollywood Park racing secretary Jack Meyers that Dr. Fager would have to carry only 124 pounds in the Californian under the allowance conditions. But when he arrived, Nerud was told there had been a miscalculation and Dr. Fager would have to carry 130 pounds. Nerud just shrugged it off. “If he’s got thirty, he’s got thirty,” he said. What the racing fans would see in 1968 was a new-look Dr. Fager. Nerud let the colt’s mane and forelock grow over the winter and equipped him with a figure-8 bridle and switched from a ring bit to a D-bit following the Californian, hoping it would prevent The Doc from getting his mouth open so far and make him more manageable. As for letting the mane grow, Dr. Fager had grown into an intimidating powerhouse and Nerud wanted him to look the part. Although Dr. Fager and Damascus were nearly the same height, Dr. Fager gave the appearance of being much larger, holding his head high, and with that long, loose mane blowing in the breeze. Damascus started the year off by heading to California and winning the Malibu and San Fernando before dropping a shocking head decision to Most Host in the Charles H. Strub Stakes over a quagmire, while giving the winner 12 pounds. Everything worked against Damascus that day. The race had been scheduled for the previous week, but was postponed due to a horsemen’s dispute with management. Damascus’ regular rider Bill Shoemaker had fractured his leg in a spill after the San Fernando and was unable to ride him. Then, heavy rains turned the track heavy and new rider Ron Turcotte wound up putting Damascus on the inside, the worst part of the track. Although Damascus was beaten, the battle lines were now drawn. Damascus and Dr. Fager were on a collision course that would bring them face to face on the Fourth of July in the mile and a quarter Suburban Handicap. But both Damascus and Dr. Fager had strikes against them going into the race. Following his victories in the Roseben and Californian, Dr. Fager looked like a sure thing in the one-mile Metropolitan Handicap, despite the presence of another nemesis from the previous year, In Reality, who was in the best form of his life, coming off three straight wins, including the Carter Handicap and John B. Campbell. But In Reality, who grew up in the same field as Dr. Fager on Tartan Farm, was never able to truly threaten the Doc. When Dr. Fager came down with a severe case of colic on the eve of the Met Mile, Nerud was forced to scratch him, leaving the race to In Reality, who won comfortably for his fourth straight victory. So, Dr. Fager had to go straight into the Suburban coming off a serious colic attack, which left him gravely ill, and having to miss the Met Mile. Damascus, who thrived on competition and needed a steady diet of racing to get himself fit, had been given four months off after the Strub and had only one easy allowance victory at Delaware Park 17 days before the Suburban. He was not as finely tuned as trainer Frank Whiteley would have liked, but the Suburban had always been his target and there was no turning back now. This was a horse who had raced 19 times in an 11-month period, 18 of them stakes, and actually kept getting better as the year went on. So, of the three big horses, only In Reality was coming into the race dead-fit and in form. Damascus was assigned highweight of 133 pounds in the Suburban, with Dr. Fager at 132, and In Reality in with 125. NYRA racing secretary Tommy Totter said he had never weighted two horses that high in a race. On the Monday before the race, Trotter received a call from Whiteley, informing him that Damascus definitely would be coming, but he wouldn’t be coming alone. Accompanying him him would be Hedevar. To Nerud, it was starting to look as if Dr. Fager would never get a chance to go one-on-one with his arch rival. But Nerud had used the same tactics with Gallant Man in the 1957 Belmont Stakes when he ran Bold Nero as a rabbit against Preakness winner Bold Ruler in the six-horse field. Whiteley didn’t care about one-on-one showdowns. His objective was winning the Suburban, just as it had been in the Woodward. It didn’t diminish Damascus’ reputation to admit that Dr. Fager was virtually unbeatable on an uncontested lead, especially trying to beat him with a come-from-behind horse like Damascus. Not only did Dr. Fager possess extraordinary speed, he was nearly impossible to crack if you looked him in the eye. But for all those who are under the belief that Dr. Fager was a need-the-lead type he did prove on several occasions he could sit behind horses in one-turn races. But there always came a time before hitting the far turn when you were forced to let him go. When he broke the world record for the mile carrying 134 pounds in the Washington Park Handicap, he sat back in fourth through an opening quarter in :22 4/5, which was a crawl for Dr. Fager. He promptly dragged Baeza up to the leaders, going his second quarter in an unheard of :20 3/5, which was believed to be the fastest quarter-mile fraction ever run in a non-sprint race and the fastest quarter within the body of a race at any distance. Despite that, and covering the three-quarters in a blistering 1:07 3/5, Dr. Fager drew off in the stretch while under wraps, his mane blowing wildly in jockey Braulio Baeza’s face. Without being asked in the slightest, Dr. Fager won off by 10 lengths in a world-record 1:32 1/5. Even Baeza admitted he had no idea how fast Dr. Fager was running. Hall of Fame jockey Ted Atkinson, who was then a state steward at Arlington, said after the race, “Hell, he could have gone in thirty and change; he was six lengths within himself.” Despite the ease of his victory, Dr. Fager’s time would become the most sought after record for the next 30 years. Based on his time, a study was made a year and a half later with the help of the St. Louis and Bronx Zoos, which concluded that Dr. Fager was faster than a cheetah, recognized as the fastest animal on Earth. On the morning of the Suburban Handicap, I took the Pioneer bus to Aqueduct and made my way into the grandstand to find a seat around the eighth pole. As the crowd of more than 54,000 began to settle in, the familiar voice of track announcer Fred Capossela could be heard over the loudspeaker: “Ladies and gentlemen, in the seventh race, number 1A Hedevar…has…been…scratched." That sent a murmur rippling through the grandstand. Hedevar, it was reported, had taken a few bad steps following a six-furlong workout, and Whiteley didn’t want to take any chances running him. What made Dr. Fager and Damascus such compelling rivals was that they were nothing alike. Dr. Fager, although a kindly, sensitive gentleman in his stall, was an untamed brute on the racetrack. With that long mane blowing in the breeze, he resembled a wild mustang dashing across the plains with reckless abandon. Once the gates opened, the only thing he wanted in front of him was the wind. Once he got the lead he had no intention of giving it up. He was an unharnessed force of nature, who, like Medusa, made all those foolish enough to look him in the eye pay dearly. When Dr. Fager's blood was up, the swiftest horse couldn't outrun him and the heaviest weight couldn't stop him. It is interesting to note that only three horses ever finished in front of Dr. Fager, and two of them are in the Hall of Fame and the other was a champion. Damascus liked to come from well off the pace, and needed constant urging to keep his mind on the task at hand. Most of his defeats came when he simply was allowed to get too lazy and would refuse to leave his opponents. He needed constant reminding. But once he did and turned on the afterburners, he would explode, turning in the most devastating move on the far turn I have ever seen, even after 49 years. Unlike Dr. Fager, who ran with his head high, Damascus would get down low and was amazingly quick and agile, pouncing on his foes like a cat its prey. His jockeys just had to keep persevering with him once he caught the leaders. When he was able to keep up his head of steam he would annihilate his opponents, as he did in the Woodward, American Derby, Travers, Wood Memorial and other races. With In Reality in the best form of his career, the improving George Widener-owned colt Bold Hour also in peak form, having won the Grey Lag Handicap, and the hard-knocking Rokeby Stable mare Amerigo Lady, the Suburban looked to be a race for the ages. Dr. Fager was sent off as the 4-5 favorite, with Damascus 7-5. Damascus was always quick out of the gate, and, as usual, he broke on top from the rail before being taken back by jockey Manny Ycaza. Dr. Fager, under Braulio Baeza, shot to the lead as expected. Baeza gave a peek over his left shoulder to make sure he was clear of Damascus before easing over to the rail. With no one like a Hedevar or Great Power to get his blood boiling, Dr. Fager rated kindly and cruised to a clear lead going into the clubhouse turn. He quickly opened up by two lengths and took complete control of the race. In Reality, who was supposed to put pressure on The Doc, had broken on his wrong lead and apparently took a bad step, causing an injury that would lead to his retirement. He raced in fourth during the early going, about four lengths back, before retreating to finish last. With Dr. Fager loose on a slow, uncontested lead, Damascus was now on a solo mission, and Ycaza had no choice but to put the colt into the fray early and test Dr. Fager, who had managed to get away with an opening quarter in :24 and half in :48 2/5, which was trotting horse time for the Doc. Ycaza took Damascus off the rail and started pushing hard to get him to close the gap on Dr. Fager. Although taken completely out of his game plan, Damascus was able to use his quickness and rapid-fire acceleration to collar Dr. Fager as they headed down the backstretch. The battle everyone had wanted to see for so long was on. Damascus pulled to within a neck of Dr. Fager, but that was as close as the Doc would let him get. He loved a challenge; that’s when those nostrils would flare and the daggers would shoot from his eyes. The pair battled through the third quarter in a spectacular :22 3/5, and that’s with over 130 pounds on their back. With his initial attack thwarted, Ycaza backed off slightly and let Damascus regroup. This was not his game, and Ycaza had to make sure he saved something for the end, especially with Damascus not being fully cranked up. Once he and Damascus were able to catch their breath, Ycaza began pushing hard once again, trying to crack Dr. Fager, which was like trying to crack a walnut shell with two fingers. Dr. Fager, with his head held high, seemed to dwarf Damascus, even though the two were about the same height. Damascus was now straight as a string as he mounted his second attack. The Doc knew he was in for a fight, and dug in once again. As hard as Ycaza pushed he couldn’t get by the tenacious Dr. Fager. Around the far turn, Dr. Fager began inching away, putting a good half-length between him and Damascus. But, amazingly, Damascus wasn’t through. He gave it one final desperate try, pulling back alongside Dr. Fager for the third time, and actually might have gotten his nose in front nearing the quarter pole after a testing quarter in :23 3/5. As they came out of the turn locked together, the crowd let out a deafening roar. Dr. Fager refused to yield. If you were trying to capture this moment on canvas you’d surely have smoke blowing out of Dr. Fager’s nostrils. Turning for home, a weary Damascus had no more to give. As fresh as he was and having to play Dr. Fager’s game, he began to retreat under the impost following a brutal mile in 1:34 3/5. Dr. Fager, who was built to carry weight, bounded clear, opening up by two lengths at the eighth pole. The improving Bold Hour, carrying only 116 pounds, had been eyeing the battle several lengths back and moved in for the kill, hoping to pick up the pieces. He collared Damascus, from whom he was getting 17 pounds, and set his sights on Dr. Fager. But Baeza was sitting chilly on the Doc, whose long mane was blowing wildly in the breeze. Baeza seemed unfazed by Bold Hour’s feeble attempt to close the gap. He merely hand rode Dr. Fager to the wire, maintaining his two-length advantage. Even with the sluggish opening half and carrying 132 pounds, Dr. Fager still was able to equal Gun Bow’s track record of 1:59 3/5. Despite his gut-wrenching attempts to crack Dr. Fager, Damascus, who wound up third in the Suburban, came back only nine days later in the Amory Haskell Handicap at Monmouth and finished third again behind Bold Hour under 131 pounds after stumbling badly at the start. As difficult as it might seem to believe, these two races actually were just what Damascus needed to get him tight and razor-sharp. He returned only a week later in the Brooklyn Handicap for his rematch with Dr. Fager. When I went to the paddock to look at Damascus, I knew this would be a different story. Not only did he have Hedevar back, he bounced around the paddock on his toes with his neck arched and muscles bulging from his shoulders and hindquarters. He was ready to tackle Dr. Fager, who was carrying a staggering 135 pounds to 130 for Damascus. Hedevar was now healthy again and this time he showed up for his search and destroy mission. The hassenpfeffer was back on the menu. Nerud didn’t bat an eye over Dr. Fager picking up three pounds. He understood the concept of handicap racing. He was more concerned about Hedevar than the weight. Nerud had toyed with idea of just having Dr. Fager try to outrun Hedevar from the start. The colt had shown the ability to rate kinder as 4-year-old, but that was when he was running freely by himself. What would happen with Hedevar blasting out there? A rank Dr. Fager lugging 135 pounds was the last thing Nerud wanted. Hedevar, as expected shot to a clear lead, as Baeza took a stranglehold on Dr. Fager. Tommy Lee, aboard Hedevar, broke from the outside, and when he looked over to his left, much to his surprise, Dr. Fager was nowhere to be seen, as Baeza kept pulling back on the throttle. Before Lee knew what was happening, he had opened a three-length lead. But Dr. Fager was not a happy camper. His head was up and he was fighting Baeza, and when Dr. Fager fought you it was only a matter of time before you caved. Ycaza, meanwhile, had Damascus well back in the pack where he liked to be. Hedevar was on a kamikaze mission, with or without Dr. Fager, and he still blazed the opening half in :45 4/5, with Dr. Fager a length and a half back. That’s 2 3/5 seconds, or 13 lengths, faster than Dr Fager had run in the Suburban. And this time he was carrying 135 pounds. By the time they passed the five-eighths pole, Baeza no longer had any say in the matter and he was forced to let Dr. Fager go. He blew right on by Hedevar and quickly opened a four-to-five-length lead. But the Doc was out of control, his three-quarters in a blistering 1:09 2/5, while Damascus, as he was in the Woodward, was in full gear and cutting into Dr. Fager’s lead with every stride. It was obvious this time it was Damascus who had the advantage. With one of his typical explosive moves, he collared Dr. Fager at the quarter pole and drew clear, but the Doc wouldn’t give up, despite the pace and staggering weight. Baeza even resorted to the whip, something Dr. Fager detested, and he threw his tail up in defiance. He fought hard through the stretch, but Damascus was always in control, winning by 2 1/2 lengths. His time of 1:59 1/5 broke Dr. Fager’s short-lived track record, and, amazingly, still stands 47 years later. And this was Damascus’ third major stakes in 16 days, carrying 130 pounds or more in all of them. Dr. Fager, of course, would never lose again, turning in what many believe to be the single greatest season in racing history, in which he earned an unprecedented four championships – Horse of the Year, Handicap Horse, Grass Horse, and Sprinter. In the Suburban and Brooklyn he ran back-to-back 1 1/4-mile races in 1:59 3/5, one off a slow pace and the other off a blistering pace, carrying 132 and 135 pounds. In the United Nations Handicap, his first ever attempt on grass, Dr. Fager, carrying 134 pounds, lost the lead three times to the tenacious Advocator, to whom he was conceding 22 pounds. Slipping and sliding the entire race over the slick grass, Dr. Fager still kept battling back, beating Advocator by a neck in what was his most courageous performance. Behind him were 1970 Horse of the Year Fort Marcy, Australian wonder horse Tobin Bronze, and a host of major stakes winners on grass. It was proven once again, you could not look Dr. Fager in the eye and beat him. On the track, he had a killer instinct rarely seen in a Thoroughbred. It is frightening to think how fast Dr. Fager could have run if the track hadn’t been winterized. Despite the deepness of the surface and the 134-pound weight assignment, the good doctor went out and battled the fleet-footed Kissin George through a scorching half in :43 4/5 and three-quarters in 1:07 4/5. Kissin George cracked under the pressure, but Dr. Fager drew off with ease, again not being touched by Baeza. He crossed the wire six lengths in front in a track-record 1:20 1/5, a fifth of a second off the world record. The scariest aspect of Dr. Fager is that, despite all his records, we still have no idea how fast he could gone had he been turned loose and allowed to tear a hole in the wind. He was a wild thing confined in a world of restraint. Just imagine Dr. Fager running today on souped up tracks carrying 120 pounds. It staggers the imagination to think of the barriers he would have broken and the records he would have established. Even with his speed harnessed and being loaded down with staggering weights, he still raised the equine genus to another plateau. Damascus would go on to win the William I. DuPont Handicap and Aqueduct Stakes, carrying 134 pounds each time. In an odd turn of events, however, he was ridden in those races by none other than Braulio Baeza, a decision made by owners Edith and Tom Bancroft. Here was the regular rider of Dr. Fager now riding the Doc’s arch rival, with whom he had battled in the Suburban and Brooklyn; and with both horses neck and neck for Horse of the Year honors. It was a decision the Bancrofts would come to regret. Baeza gave Damascus a poor ride in the Michigan Mile and an Eighth, taking him so far back and leaving him with far too much ground to make up on the 3-year-old Nodouble, who was in receipt of 22 pounds from Damascus. One of the true iron horses, Damascus began having issues with a tendon. When he was beaten a nose by Mr. Right in a slowly run Woodward Stakes, with Baeza putting Damascus in a head-and-head battle on the lead and then never going to the whip on the colt, despite a :26 final quarter and final time of 2:03, Whiteley became so infuriated, he unleashed a verbal assault on Baeza upon his return. Whiteley and everyone knew Damascus had a tendency to get lazy and needed the whip (Bill Shoemaker on occasion would go to the whip at the half-mile pole). Whiteley, not wanting to use Baeza for obvious reasons, remained furious with the rider for getting Damascus beat in that manner and never spoke to him again. The Bancrofts wanted Damascus to end his career in the Jockey Club Gold Cup, although the colt’s tendon was getting worse. Whiteley equipped him with front bandages, an ominous sight indeed, and put Larry Adams up for the Gold Cup. The record shows that Damascus was beaten 37 lengths, but the truth is, while any other horse would have been eased to a halt, Damascus, in obvious discomfort, jogged home and refused to be eased until the second he crossed the finish line. One step past the line he came to a dead stop. One of the saddest sights I’ve ever seen on a racetrack was Damascus, one of the toughest, most durable horses ever, having never finished out of the money in 31 career starts, being loaded onto an ambulance. Although Damascus and Dr. Fager provided so many thrills in their career, both being elected to the Hall of Fame, it was that summer of 1968 in the Suburban and Brooklyn that they tested each other’s greatness. They showed in the Suburban that historic battles need not be limited to stretch runs. When two courageous heavyweight fighters pummel each other for 10 rounds, neither backing down, it doesn’t detract from the epic nature of the event if one knocks out the other in the last round. Yes, both colts set track records in those two races, while carrying staggering weights, but it was their gut-wrenching confrontation down the backstretch and around the far turn in the Suburban that still brings chills to all those who were privileged to witness it. Although the outspoken Nerud and the reserved Whiteley were opposite in personality and training methods, and rarely competed against each other, they will be forever linked by the intense and often controversial rivalry between Dr. Fager and Damascus. Both trainers were perceived to be bitter antagonists, due in part to Whiteley’s use of a rabbit against Dr. Fager. But both later admitted they had tremendous respect for each other. It’s been 47 years since those epic confrontations, and with Frank Whiteley’s passing at age 93 in 2008 and now John Nerud’s death this week at age 102, as well as the death this year of Allen Jerkens, it marks the end of an era when racing was truly The Sport of Kings.